After many years as a leather wholesalers, it reopened as a pub in early 2013, having last traded as a pub in the late 1980s. 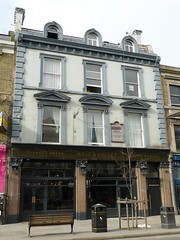 It is owned by the Barworks chain who operate other several other good beer bars/pubs like The Earl of Essex. It's been given a good overhaul prior to reopening, with as much of the original tiling preserved as still exists (much of it having come off over the years), and a striking wooden island bar. They've even commissioned a new sign inside the door in old-fashioned style photo to fit in with the original pub name outside photo. The best feature of the bar, setting it apart from many other local bars in this trendy area of Shoreditch near the top of Brick Lane, is that it has four handpulls for ale. On Ewan's March 2013 visit, they were offering ales from Bristol Beer Factory, Revolutions, Endless and one other (all apparently £3.80/pint), all well-kept. However, there's also a very strong bottled beer list, from a range of countries and in a range of styles (including plenty of porters to go along with oysters on the food menu) photo of drinks menu. Draught beers including Estrella Damm (£3.90/pint), Camden Hells and Gentleman's Wit (both £4/pint) and Camden Ink (£4.10), as well as beers by Paulaner, Weihenstephan, De Molen, Summer Wine and Old Dominion, and ciders by Weston's and Orchard Pig. There are also a small number of wines, as well as spirits behind the bar. Seating is a number of tables around the front and side, as well as larger booths clad in leather to the rear, and stools around the bar itself photo. There's a beer garden to the rear with large windows letting in plenty of light during the day. On a weekend afternoon in March 2013, the place wasn't too busy, with music playing quietly in the background, but it no doubt gets filled to capacity in the evenings. The food menu focuses primarily on oysters (£14) and sliders (small bite-sized burgers, three for £7.50) photo of food menu in Mar 2013, though we didn't sample it on our visit. There appears to be a cocktail bar downstairs, though it wasn't open on a Saturday afternoon. Accessibility: No steps to get in or to the beer garden (though most of the beer garden is down one step). Toilets are downstairs, though. Last visited by Ewan and Kerry, March 2013. Opening hours taken from Facebook, March 2013. Last edited 2013-05-10 08:13:56 (version 4; diff). List all versions. Page last edited 2013-05-10 08:13:56 (version 4).